We’re down to the final conference with our nonconference schedule grades. It’s up to the SEC. The East has one major CFP contender (Georgia), and a few other potential dark horses. Did any of those teams schedule in a way that sets up for a CFP run? Will the selection committee even care if they didn’t? We’ll judge the schedules here, and leave the committee’s decisions up to the committee. Lastly, the ACC and SEC present a bit of difficulty. I expect every team–even from the Big Ten, Big 12, and Pac 12–to play at least one Power 5 opponent. If I was being fair, I would expect the ACC and SEC teams to play two, since they play one fewer conference game. However, since almost none of them do that, it would feel like I’m capriciously lowering the score of every team in those conferences. On the other hand, it isn’t fair to the Big Ten, Big 12, and Pac 12 to judge them all evenly. Therefore, as a compromise, I don’t knock down the scores of ACC and SEC teams for playing fewer conference games, but it will be tougher for me to give them the highest grades. Last season Florida treated us to a great opener against Michigan. This year, we aren’t so lucky. Two former Jim McElwain schools will square off here. Don’t sleep on the Rams. This isn’t the toughest of Group of 5 teams, but it’s no pushover either. Florida will face what is technically its second FCS school of the year. This game was originally played in 2014, but canceled due to lightning after just one play. The game was then rescheduled for 2017. That didn’t work out, and it was then rescheduled for this year, but not before Idaho announced it was dropping back to FCS. At the time Florida scheduled this game, the Gators knew full well it meant having two FCS games on the schedule. And–here is the kicker–Florida is doing the same again next year, playing both UT-Martin and Towson. This is the only really good game on Florida’s schedule. I won’t complain at all about a road game against a perennial CFP contender. This is redeemed by the great game against Florida State, but playing two FCS teams is a bad look. Florida may have an excuse, kind of, for it–but that excuse falls apart once you look into what happened. At least the last game is against Colorado State and not a true cupcake. Georgia will open up the season against an FCS team, and a bad one at that. MTSU is a decent Conference-USA team, and should provide no competition whatsoever to a team of Georgia’s caliber. UMass is a steadily-improving FBS independent in Mark Whipple’s second stint as head coach, but the Minutemen are still one of the worst teams in all of FBS. This usually one-sided annual rivalry has provided some good games recently, but Georgia is trending towards being a top team in the country and Georgia Tech is, well, not. The Yellow Jackets sometimes challenge and can be a Top 15-25 team, but they’re not a program that’s near Georgia’s level right now. It’s hard to understate how bad this schedule is. Georgia is a potential CFP competitor and plays four home games. Not only that, there is a good chance that not a single one of those games is against a team that will end the season with a winning record. Unless some other SEC teams step up, this could be the weakest resume that any CFP team has had. 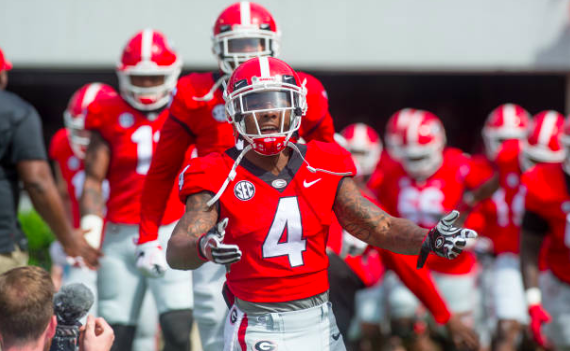 Georgia better not lose a game, because this schedule does not offer much margin for error–as long as the selection committee actually cares. Kentucky opens the season against a decent MAC team that has a penchant for upsetting P5 teams. In short, this is a very risky game for Kentucky to play. I love it. I don’t love this game against an FCS team, though. Kentucky will prep for its rivalry game against MTSU, another somewhat-dangerous Group of 5 team. Props to the Wildcats for not going full cupcake with both of their should-win games. This rivalry always seems to produce great games, even when the teams involved aren’t great. With Louisville presumably taking a bit of a step back this year without Lamar Jackson, I see no reason not to expect another great one. I really like this schedule. There’s nothing super-special on here, but there are three solid games. I can’t ask for much more than that, especially from a team that will likely need a great year to make a bowl game. Missouri starts off the season with an FCS team. The Tigers host Wyoming, which has seen an incredible turnaround under coach Craig Bohl. This isn’t the cupcake it was once meant to be. Mizzou better be careful. I’m always a huge fan of equal P5 programs playing home-and-homes. This is great to see. It’s a battle of the Tigers as Missouri hosts one of the most dangerous Group of 5 teams from the past few years. Huge props to Missouri for scheduling this dangerous game. Aside from the opener against an FCS team, this is a great schedule. Missouri might not be the same team that went to back-to-back SEC Championship Games, but this program has tremendous potential and is challenging itself accordingly. I wish Georgia was playing a slate half as good as this one. South Carolina opens against an in-state school that is no longer in FCS. Still should be a guaranteed win, though. The Thundering Herd has been an enigma recently. Doc Holliday’s team has been up and down, but this is still a usually-consistent Group of 5 team. Considering that this game comes right after hosting Georgia, it’s a solid one. An SEC team playing a November FCS school? I’m shocked. South Carolina is a trendy popular dark horse team in the SEC East–that is, for anyone crazy enough to pick against Georgia. If the Gamecocks do have their division won by the final weekend, we could have a virtual CFP qualifier on our hands. There are two total cupcakes on this schedule, but I’m really happy with the other two games. That Clemson game could be a great one, and Marshall is always risky to schedule. Tennessee has given us a great opener the past two years, and looks like it will give us another. This will tell us a lot about the state of these respective programs going into 2018, not to mention that it will likely be a very entertaining game. It’s an in-state FCS game, and against a weak FCS team to boot. The Miners were likely the worst team in FBS last year. We’ll see if that continues this year, but it looks likely. If you want an FBS team that might be worse than UTEP this coming year, look no further than Charlotte. You have to try really hard to make a nonconference schedule worse than Georgia’s in the SEC East, but Tennessee succeeded, somehow. The opening game is great, but it goes downhill fast. The only saving grace for Tennessee is that it isn’t a CFP contender. The Volunteers need to stockpile wins to try and go bowling, and they certainly succeeded with this schedule. Jeremy Pruitt was gifted a chance to inflate his record in his opening season in Knoxville. Vandy starts out with a winnable game against a sometimes-tough Conference-USA time. That’s a solid start. The Wolf Pack is a far cry from its 2010 glory days with Colin Kaepernick at the helm. Scheduling Nevada doesn’t take much guts, but there are far worse cupcakes out there. Vanderbilt might be biting off more than it can chew with this game, but I’ll never fault a P5 team for traveling to South Bend. The Commodores have their FCS cupcake in their final nonconference game, but at least it’s not in November. Vanderbilt is giving us two likely good games, with a third that has a chance of being somewhat competitive. I can’t ask for much more from Vanderbilt, especially considering that a lucky cross-divisional draw (Arkansas and Ole Miss) means it has a chance at making a bowl this year.